Scott Gregory is very well known as the proprietor of the popular Caddies Café in Freystrop on the outskirts of Haverfordwest where his customers enjoy not only good food but the warm welcome that Scott always provides. 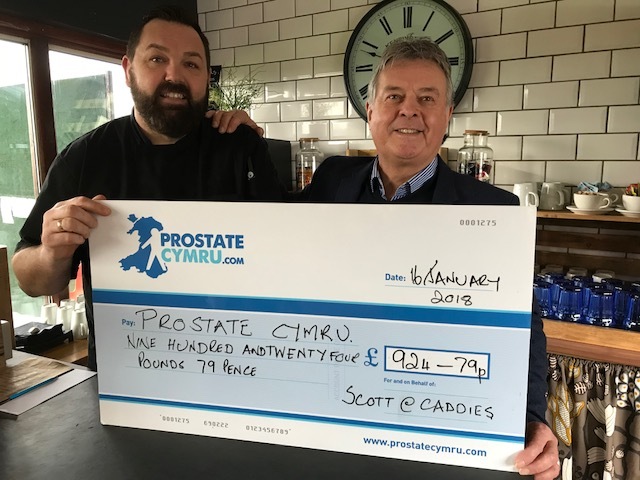 Recently Scott demonstrated that he not only is he an excellent chef but that he has a big heart, in keeping with his physique, by supporting Prostate Cymru by running the Cardiff Half Marathon and holding a raffle which together raised £924.79 for the charity. Scott travels the world to follow rugby and meet up with sporting legends. However, recently Scott didn’t have to travel far as in order to show their appreciation for what Scott had undertaken for Prostate Cymru two of its ambassadors, and rugby legends, Eddie Butler and Graham Price paid Scott a surprise visit to Caddies Café to thank and congratulate him on his wonderful achievement by endeavouring to run the very challenging Cardiff Half Marathon. Brian Harries in receiving the cheque said ”Scott has really gone the extra mile to raise such an excellent sum for the charity and supporting its work through it’s mainly voluntary group dedicated to fighting prostate cancer in Wales by raising awareness and procuring equipment as it affects so may lives”.